TAQA is an international energy and water company operating in 11 countries with investments in power generation, oil and gas exploration, production and storage. TAQA Bratani operates as a subsidiary and is one of the largest oil and gas operators within the North Sea. Operating from 5 offshore platforms, business includes oil and gas exploration, development, production, storage, processing and transport. TAQA were experiencing issues within a gas compressor motor on one of their offshore platforms. They had conducted condition monitoring on the unit which highlighted degradation within the insulation system on the rotor. Upon further investigation and analysis, they had concluded that a new rotor was required. TAQA purchased a new rotor for the motor. 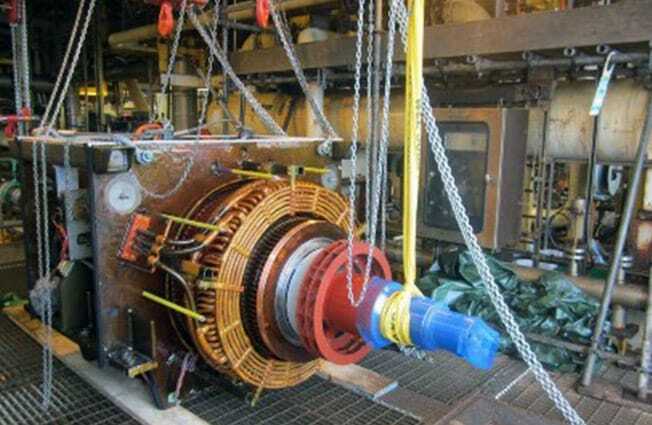 The OEM and Quartzelec were awarded the contract to carry out the project management and manpower to replace this rotor offshore for the 6.9MW motor which included withdrawing the faulty rotor, replacing this with the new rotor and then re-instating the motor into service during a planned outage. Planning was critical to ensure the correct strategy was adopted for the safe and effective removal of the machine from its current position up to the mezzanine level of the platform to allow the rotor to be withdrawn from the stator of the motor. A detailed 22 step operation took place offshore by Quartzelec including; electrically and mechanically disconnecting the HV motor, carrying out alignment checks from motor to gearbox, removing and housing cooling pipework, uncoupling the gearbox, uplifting and movement of motor to the mezzanine deck, unthreading of faulty rotor from stator of motor, carrying out electrical and mechanical tests on the stator, installing new rotor into stator, refitting of bearings and pedestals, movement of motor back into position, re-assembling the motor and re-instating cooler and pipework, re-aligning motor to gearbox and carrying out coupled run of complete machine to ensure it was fully functional and operating correctly.